It’s a continual source of amusement because nobody expects it. 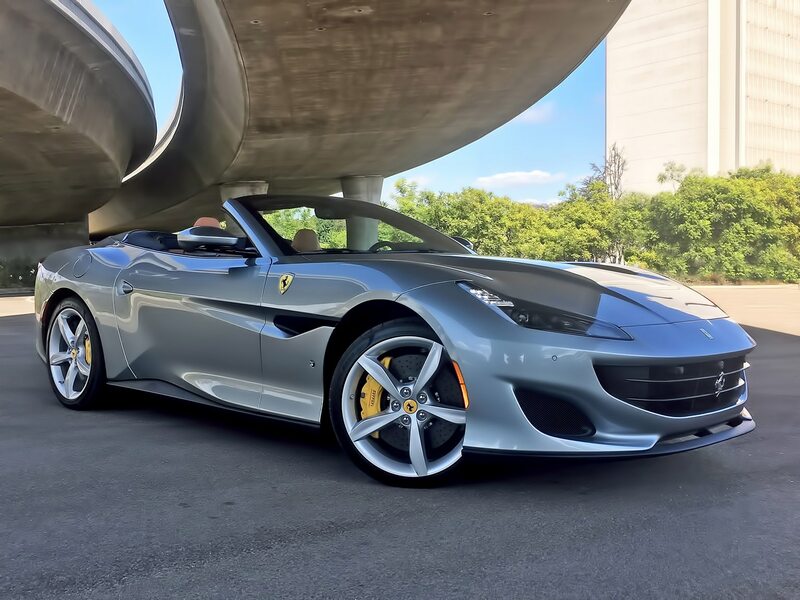 The roof on the new Ferrari Portofino—the all-new replacement for the outgoing California T—has cuts and breaks in it, sure, but it still looks a lot like a permanent hardtop. Then you push the button on the center console and—“Whoa! 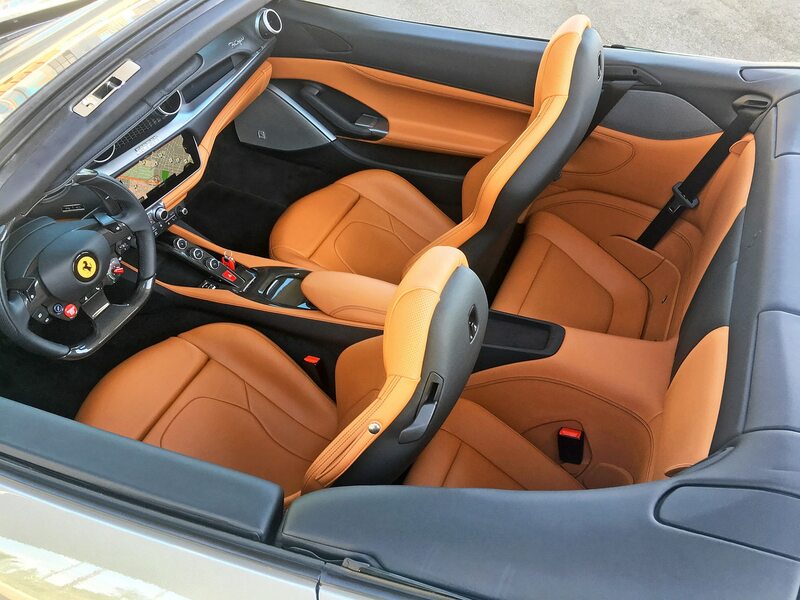 Look at that!”—the eyes of anyone standing nearby go full wide as the Portofino’s rear end folds open, the roof raises up, and the entire “fixed roof” lowers down into a space that, just a few moments earlier, looked far too small to swallow a couple golf bags, much less an entire hardtop. 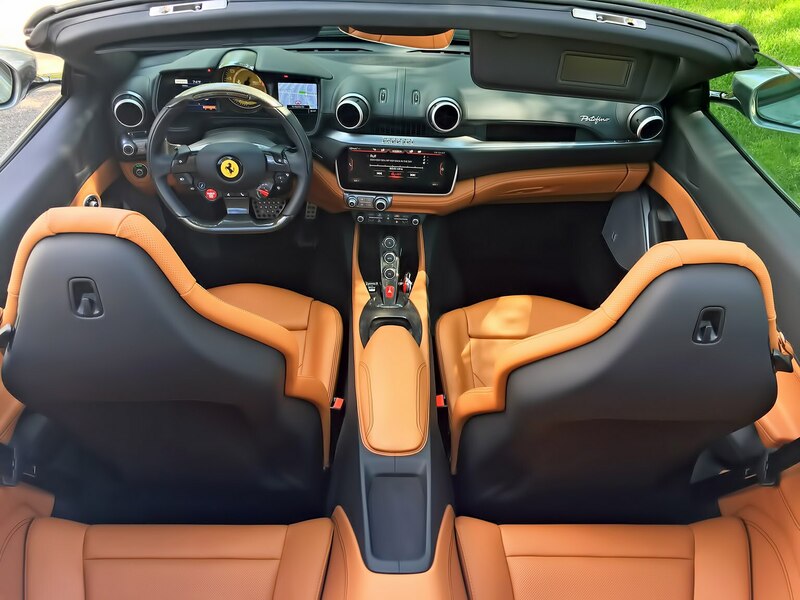 When the roof is packed away, though, the Portofino looks like it was made to be a drop-top full-time—especially given the two dramatic fairings that rise up behind each rear headrest on the rear deck. 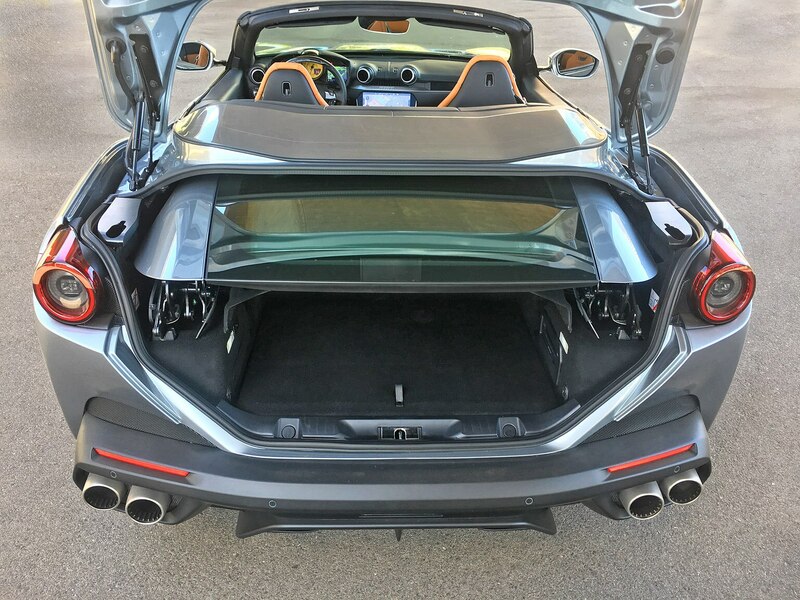 Amazingly, even with the hardtop folded away, there’s still a decent amount of trunk room underneath it. And, man, does this mighty V-8 throb with torque. There’s so much on tap, in fact, that Ferrari doesn’t even allow all of it to come on stream in first through third gears. The engine-management computer then metes out more of it as you climb through the gearbox, but only in seventh do all 561 pound-feet get to play. At the wheel, in auto-shifting mode, what you notice is the transmission shifting quickly into seventh at every opportunity—the better to reduce the V-8’s ravenous thirst for fuel. It’s not an issue, though, as there’s so much brawn available the Portofino accelerates smartly even when churning away at low revs in top gear. 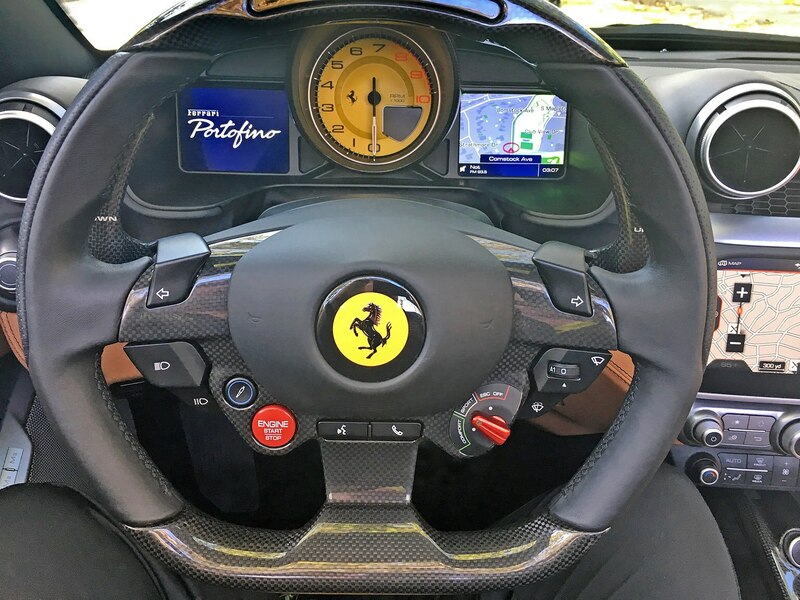 That said, I never used automatic mode after giving it a brief test, always switching to manual and shifting myself with the carbon-fiber paddles behind the wheel. Yeah, I burned through a lot of dinosaur juice doing so, but above 3,000 rpm or so the engine sounds so electric and raw no Portofino owner would want to drive it any other way. It’s worth noting that, compared with the California T, the new car’s exhausts are larger in diameter and are now electronically controlled. When fully open, they emit a far hairier cry than the Cali’s more subdued bellow. 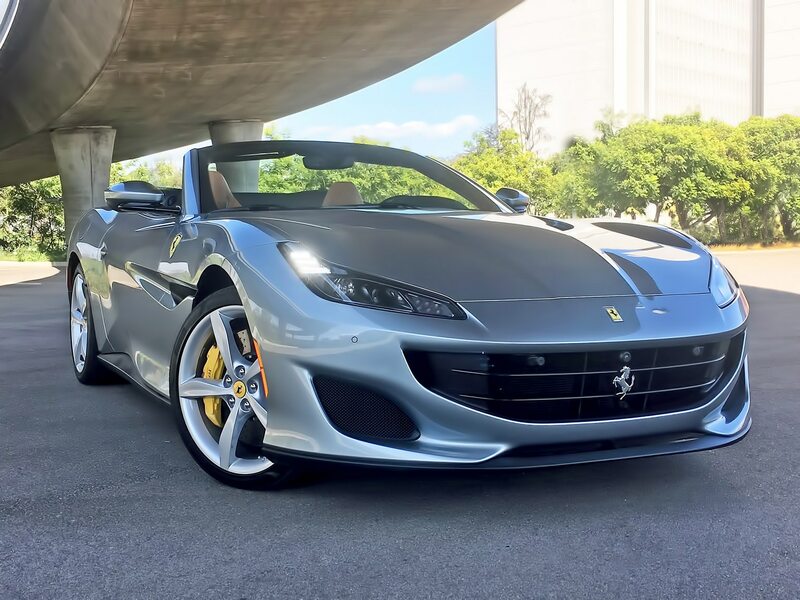 In terms of beauty, the Portofino trounces the California T. Yes, Ferrari made improvements from the original California to the T that refined the shape of the latter car, but the Portofino runs in an altogether more stylish crowd. It’s a stunning car to look at, full of curves and creases and scoops, almost all of them functional as well as arresting (thin vertical intakes next to each headlight, for instance, feed air down and out through the front wheel spokes to reduce drag). Nobody I met while driving the car around Los Angeles had anything but applause for the styling. 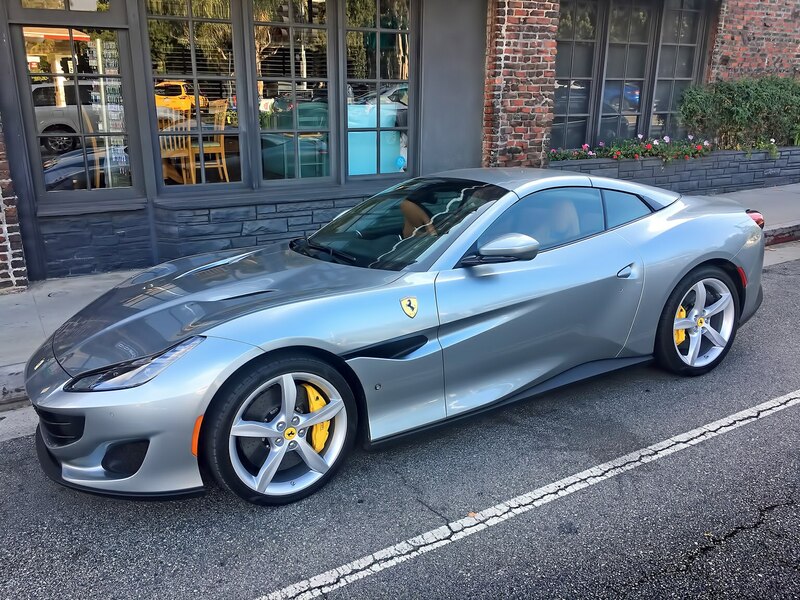 At a stoplight, one guy in a big SUV looked down into the open Ferrari and offered: “Let’s trade. You can have my truck. And the three kids in back. And my wife.” His wife was in the passenger seat. She did not appear to be laughing. 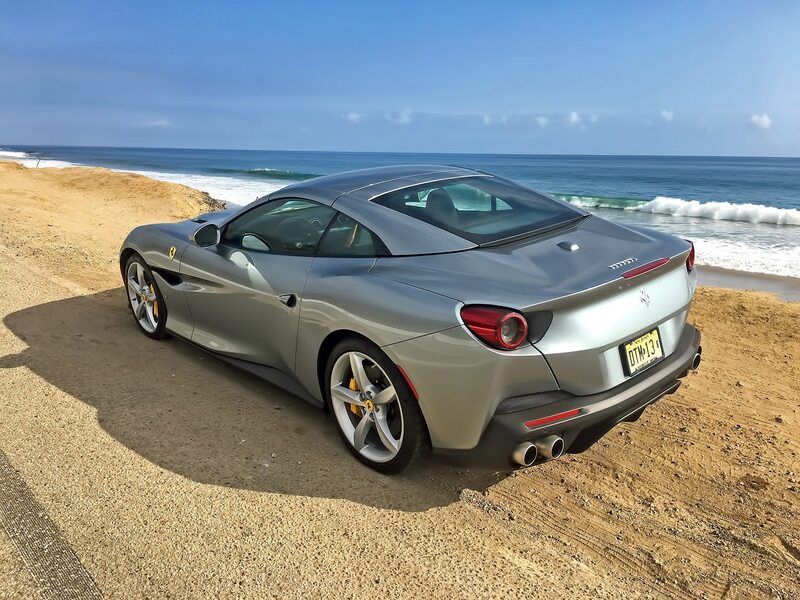 My test car carried the optional magnetorheological adaptive shocks ($5,568), and if you’re shopping for a Portofino you’ll want them, too. Even in Sport mode (selected via the manettino dial on the steering wheel), the ride is sublime. 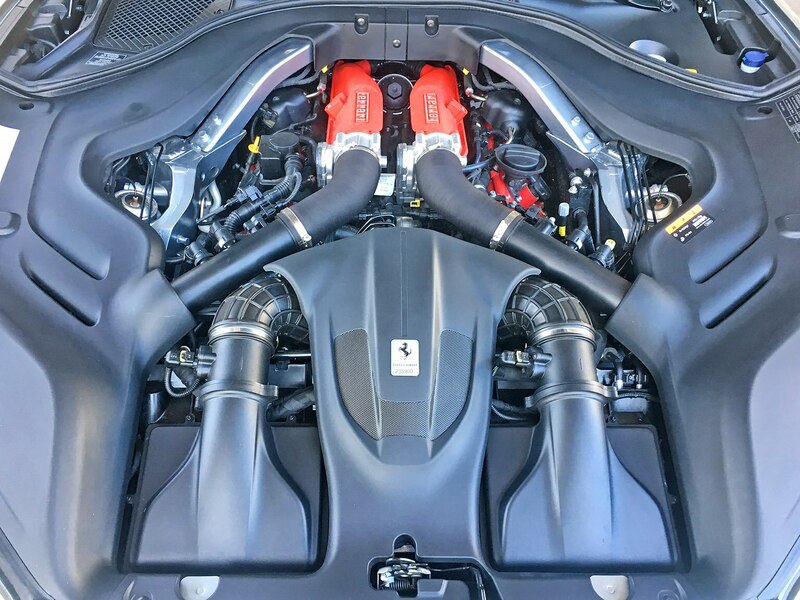 The engineers at Ferrari have long possessed an almost super-human power to craft suspensions that deliver both staggering handling prowess and the luxurious glide of a magic carpet. 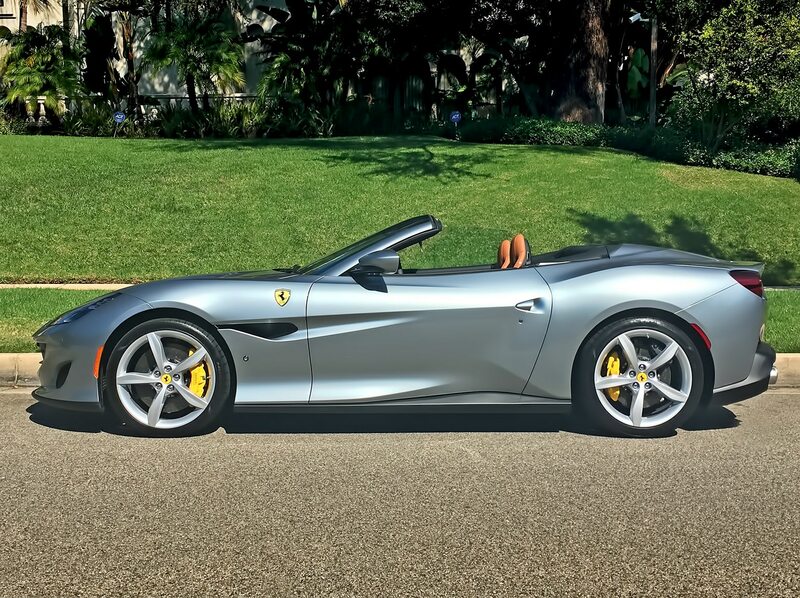 The Portofino is no exception. Switching to Comfort softens things just a tad, but not enough that I felt the need to drive in anything but Sport all the time. 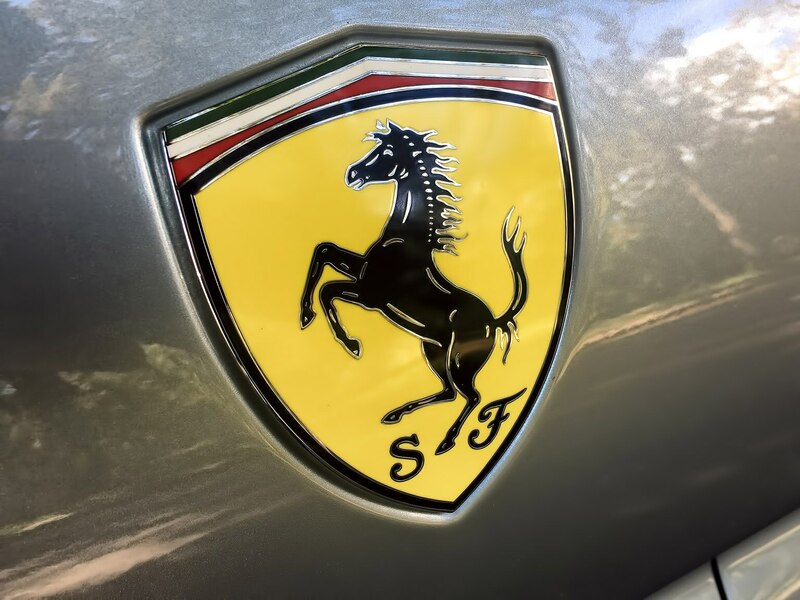 Standard are Ferrari’s F1-Trac traction-control system and a newly added E-Diff differential, originally developed for Ferrari’s Formula 1 cars. The electronically controlled system continually adjusts the torque between the two rear wheels as needed, making for formidable grip when powering out of corners and all but eliminating wheel spin. 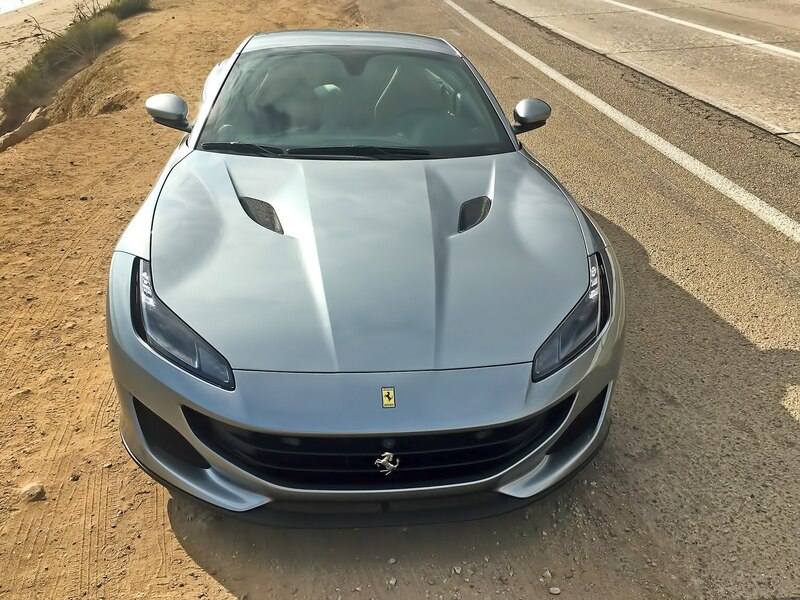 During a few hours hurling the Ferrari through my favorite mountain passes in Malibu, the Portofino proved literally breathtaking, attacking turns with massive lateral g forces, steering with precision (the Portofino is only the second Ferrari, including the new 812 Superfast, to feature an electronically assisted system), and braking powerfully and securely every time (carbon-ceramic rotors are standard). 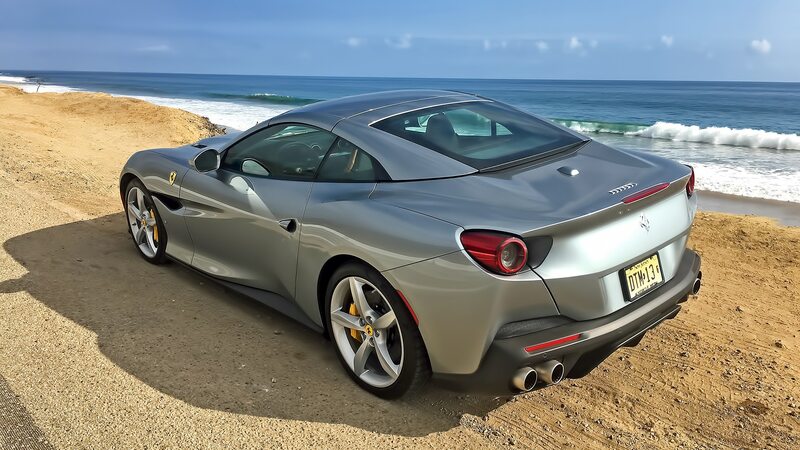 I should note that Ferrari managed to cut nearly 200 pounds compared with the California T, yet body rigidity is said to be improved by roughly 35 percent. 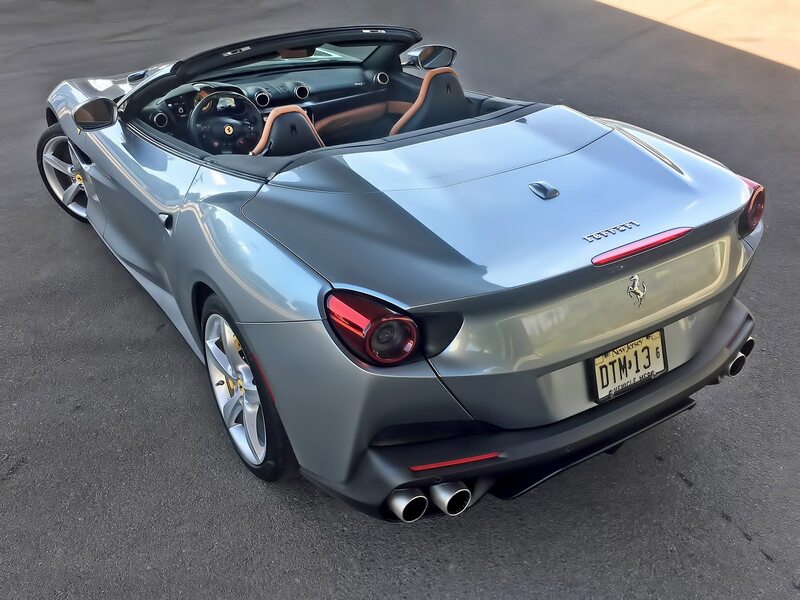 For sure, even with the top stowed away, the Portofino felt nothing but tight and solid, with only the slightest trace of body quivers on really broken pavement. Also to note: The rear seats are mostly just there for appearances, but several times I drove with my wife up front and, in back, my 5’ 8” daughter (possible by sliding the passenger seat fully forward). My daughter grumbled a bit about the limited legroom but, hey, she was riding in a Ferrari. She didn’t grumble much. 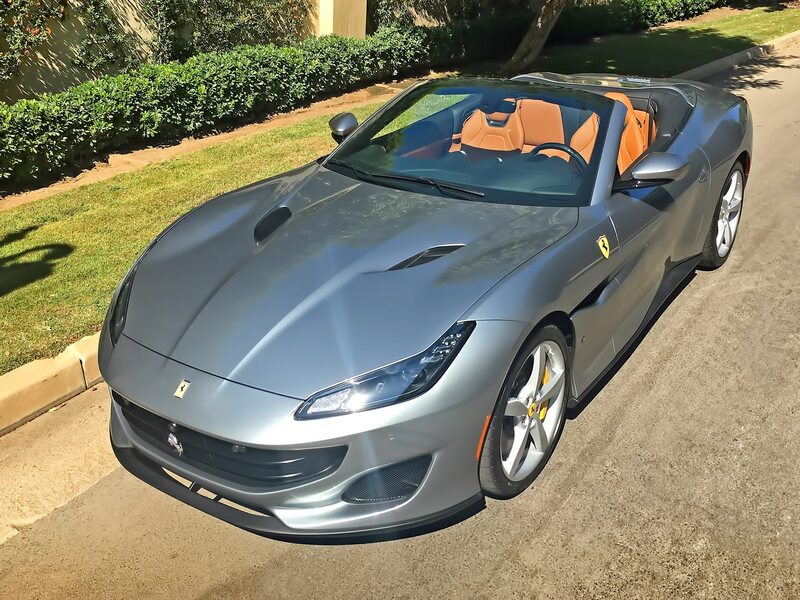 The Portofino starts at just under $211,000, but my test car—painted in Grigio Titanio with a Cuoio copper-colored leather interior—checked in at $268,608. The options are staggeringly costly, including $4,219 for Apple CarPlay (yikes! 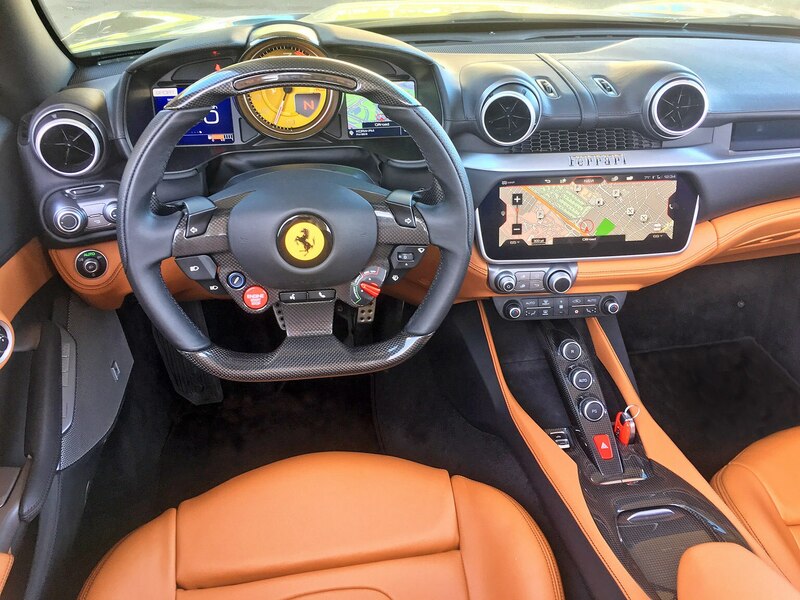 ), $1,856 for Scuderia Ferrari shields on the front fenders, $6,075 for front and rear parking cameras (they work great, by the way), $6,412 for fully electric seats, and $6,412 for a premium audio system. 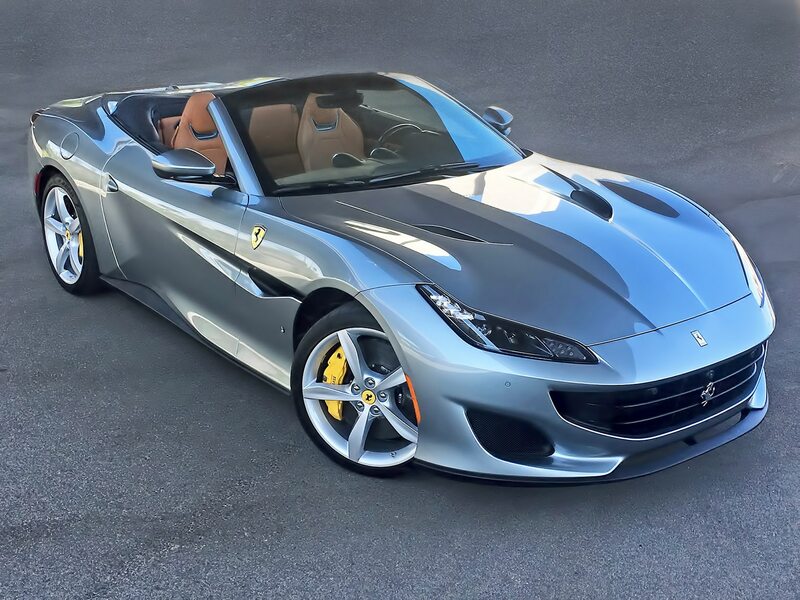 Having said that, do you honestly think any potential Portofino buyer cares whether the car costs $211K or $270K? Me either. They just want the car, and if I had the kind of money to go shopping at a Ferrari store, I’d feel the same. Frankly, all the options on my tester, never mind how expensive, truly did add to the magnificently comfortable and always-stirring motoring experience. As test cars always do, soon enough the Portofino turned into a pumpkin and disappeared, whisked from my hands and back to its permanent garage. But this was a special one. I’ll be fondly remembering this remarkable new Ferrari for a long time to come.